This is a wonderful quotation by Martin Luther King, Jr. Believe in yourself, your abilities and know for a fact that no loss is permanent. Have a good day! I wish for a tropical breeze to lighten the intense humidity that hugs this August morning. The porch, thank goodness, is high off the ground and the mildew on the screens somewhat block the steamy rays from the sun. The sky is intensely blue and the ocean is still and quiet—waiting. I breathe in slowly through my nose and exhale gently through my mouth, waiting for what I know must come. I feel powerless to change my fate. This is another in my series on science-fiction films. 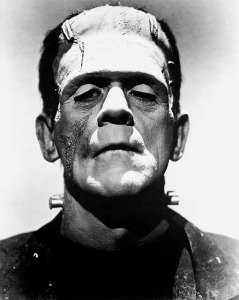 The movie that I will discuss in this installment is Frankenstein. This 1931 film was directed by James Whale and produced by Carl Laemelle, Jr. Universal Studios was following up its huge success with Dracula earlier in the year, so this film seemed like a natural choice to make. I have posted on Frankenstein before in my series on horror films, but like its namesake novel, it can also been seen as early science-fiction. This is a wonderful haiku.